It’s the first time the Trump administration has publicly put a dollar amount on a proposal that has since been ambiguous and lacking in detail. “Funding will be used to purchase new equipment, analyze and incorporate OPM business processes into GSA processes, incorporate OPM systems into GSA’s network, move and transition OPM staff, and perform audit and security assessments of those systems,” GSA wrote in its joint 2020 budget justification with OPM. But the agencies’ 2020 budget request provides a few other details about the administration’s plans for the OPM reorganization. And it leaves many questions unanswered about the administration’s specific plans for the reorganization, namely how many OPM employees would move to GSA or other agencies — or how many OPM employees may stand to lose their jobs altogether. The request doesn’t outline specific phases with deadlines for the reorganization. It doesn’t include an analysis or projections of how performance of current OPM functions might improve under GSA. The transfer of the governmentwide security clearance portfolio and merge of OPM’s National Background Investigations Bureau (NBIB) with the Pentagon’s Defense Security Service will be made official with an executive order, which officials have said the President is supposed to sign “soon.” DSS is poised to take over the security clearance portfolio by Oct. 1, 2019. According to the 2020 request, HR Solutions, OPM’s in-house, fee-for-service organization that manages USAJOBS.gov, USA Staffing and USA Hiring, among other projects, as well OPM’s IT, will move to GSA in fiscal 2019. OPM’s Retirement Services and Healthcare and Insurance organizations will move to GSA in 2020, the request said. OPM’s transactional services, which include HR Solutions, retirement services and health and insurance, would act as GSA’s “third service,” in addition to its existing Public Buildings Service and Federal Acquisition Service. OPM’s inspector general office and oversight functions will also move to GSA and will “complement GSA OIG’s expertise conducting audits, investigations and evaluations and providing recommendations to help improve the efficiency and effectiveness of agency operations,” the reorganization request said. In addition, OPM’s Merit System Accountability and Compliance division would also move to GSA. But the 2020 budget request doesn’t detail what specific legal authorities the administration believes it has to transfer some OPM functions without legislation, nor does it specify what parts of the agency could be transferred administratively. The budget also describes the administration’s intent to create a new federal workforce policy office within the Office of Management and Budget. The office will focus on strategic workforce planning and employee performance management policy. The new office, which doesn’t yet have a name, and its relationship with GSA, would be modeled after the Office of Federal Procurement Policy, according to the budget request. To stand up this new office, OMB has asked for $400,000 and projects a mere three full-time equivalents to staff it. This new office would supplement OMB’s existing career staff who work on federal personnel policy and would work in tandem with GSA’s functions. But without more detail in the OMB, GSA or OPM budgets, it’s unclear how exactly the administration plans to elevate federal personnel policy and manage human capital of “one of the largest workforces in the world,” as the administration described. Move of OPM, GSA personnel? Despite the administration’s plans to merge much of OPM with GSA, the joint budget justification from the two agencies still very much reflects the existence of two separate entities. provide other oversight,” according to the proposal. The recommendation is contingent on legislation authorizing the merger of OPM’s IG office with GSA’s. In total, the administration envisions a joint IG office with a budget of about $98 million, the request said. The budget request, for example, doesn’t detail the operating costs for a joint OPM-GSA general counsel’s office or communications shop, functions that would likely be consolidated or downsized with the merger of two agencies. OPM and GSA’s budget requests also present differing pictures of their respective workforces. 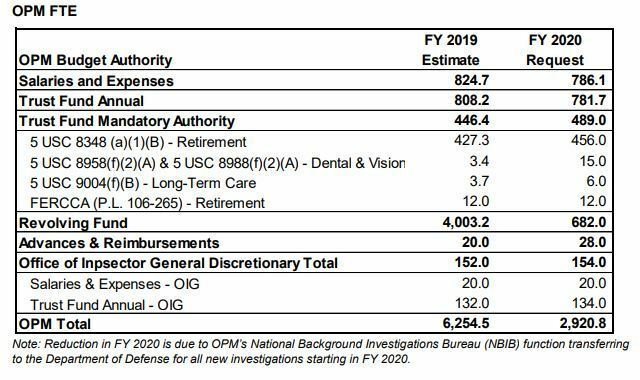 OPM expects it will lose at least 3,488 employees over the course of fiscal 2019 due to the planned transfer of the NBIB by Oct. 1, the agency said in its 2020 budget request. OPM has an estimated 6,254 employees in 2019. The 2020 budget projects OPM will have 2,920 employees. But the most recent budget request doesn’t indicate where OPM’s remaining 2,920 employees will go. GSA’s budget request shows only a slight bump in personnel between 2019 — a total of 11,791 — and 2020 — 11,852 employees. Even if the planned OPM-GSA merger doesn’t happen as planned, OPM stands to lose a significant amount of funding with the loss of NBIB to the Pentagon. The administration estimated total OPM funding at nearly $2.2 billion, including appropriations, mandatory trust fund authorities for federal employee retirement and health care benefits, its revolving fund and other authorities. With the loss of the security clearance business, OPM would lose nearly $1 billion from its revolving fund, for a total of nearly $1.3 billion in funding. At least two sources have told Federal News Network the administration is considering whether it could feasibly draw on Title 40 of the U.S. Code as the legal authority to move OPM’s IT systems to GSA without help from Congress. A section in Title 40 allows the Office of Management and Budget to review and take action if it believes an agency isn’t managing its IT properly. Specifically, OMB can recommend a reduction or increase in IT funding through a congressional budget request, cut or adjust apportionments and reapportionments of IT appropriations or use other “administrative controls over appropriations to restrict the availability of amounts” for IT, according to Title 40. GSA’s budget request includes $5 million to support the transfer of OPM’s IT to the agency. Though the request doesn’t detail how exactly it will accomplish the move, GSA pointed to OPM’s persistent challenges with its IT.